During and after his lifetime, this person’s image was more common than any other human being’s in history. He was called the son of a god. Some stories have it that his mother conceived him miraculously. He had such a profound effect on society that some claimed to have seen him after he died. He is said to have instituted a great era of peace unmatched to this day. He still has an effect on western civilization some 2000 years later. Star Wars. Is it too early to get in line? I’m in. I’m totally in. 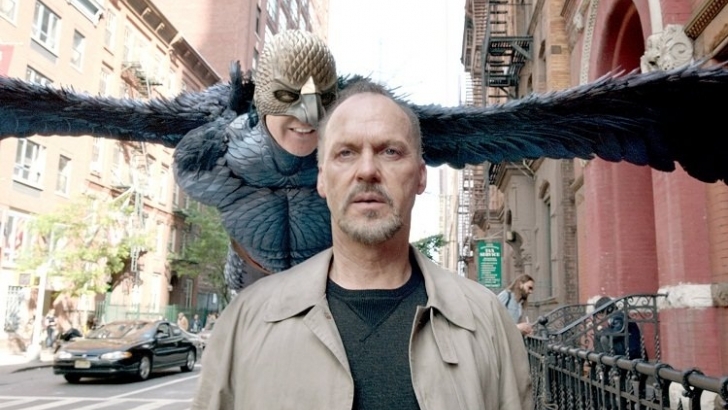 “Birdman” is both an indictment of a movie culture that gives us nothing but franchise superheroes and CGI explosions… and of actors and artists who think they’re oh so above donning a latex suit and making a hundred million on opening weekend. The film is a technical masterpiece, put together as one long tracking shot over nearly two hours, and the director never clues you in on exactly what is in Michael Keaton’s head and what’s not in this play within a play… But it’s is also an utterly brilliant piece of acting from a guy who once donned a latex suit for Batman in the late 80s. “Birdman” piles the bravery of showing aging human bodies in all their ugliness in brutal reality on top of what can only be fantasy and pretension, in ever-arching circles of self-awareness while ultimately closing its eyes and letting us fly away from it in the end. Okay. Here’s comes a “you kids get off my lawn” rant that is sure to offend. You’ve been warned. The only way to be completely safe is for me to not mention anything about any holiday, because someone somewhere will be offended at what IS said or ISN’T said, and there’s just no winning that battle. Xmas or Christmas or whatever anyone wants to call it seems to have become a season about finding offense about something. It’s a “war on Christmas!” because someone didn’t enunciate the greeting with enough orthodoxy. It’s enough that the season starts the commercialization nonsense earlier and earlier, and it’s enough that it’s become all about greed and buying the biggest and best and beating everyone else at gift-giving… but now it’s all about taking offense and working hard to find some reason to be offended at how someone else either celebrates or doesn’t celebrate it. I’m really tired of the whole shebang and will be happy when January comes around. The date was July 30, 1981 and the president was President Ronald Reagan.